Retro toys, games, and characters are hot this holiday season. Slinky from 1943, Colorforms from 1951, and Mr. Machine from 1960 are just some of the beloved classic toys that are now all the rage with modern kids. Back To Basics Toys offers hard-to-find toys and games. The online catalog features more than 700 time-tested and innovative toys and games spanning more than two centuries from the 1800's through today. "Special toys bring back powerful childhood memories," said Ken Moe. "Parents and grandparents can have so much fun discovering those hard-to-find childhood favorite toys and games and sharing them with a child in their life. Back to Basic Toys is proof that they do make them like they used to." "Retro and nostalgic toys and games will be a hot commodity this holiday season," said Reyne Rice. "Classic toys and games are being reintroduced to a whole new generation of kids, who are eagerly adding them to their holiday wish lists." Flexible Flyer Sled (1898) -- Cherished for generations, this original snow-day survival gear is sturdily constructed of solid Maple and rust- resistant steel runners. "Original" Singer Chainstitch Sewing Machine (1898)- Now children can learn to sew with this lightweight child-sized battery operated replica featuring foot pedal, working light and tension dial. The Classic Erector Set (1914) -- First introduced by A.C. Gilbert in 1914, the Erector Set was inspired by railroad workers erecting an electrical system out of steel girders and rivets. Limited Edition Pedal Fire Truck Set (Late 1920's) -- Styled after the late 1920's model the Pedal Fire Truck has everything a young firefighter needs to keep the pretend play going all year long. Snoop n' Sniff (1938) -- Introduced in 1938 the Snoop n' Sniff dog has become a best friend to generations of children, with tail wagging and legs clicking along during its daily walks. Comes in a retro box with authentication medallion and history booklet. Radio Flyer Wagon (1938) -- The classic all-steel seamless body and sturdy hardwood stakes have stayed the same for over 65 years. Slinky (1943) -- Marine engineer Richard James invented the Slinky in 1943 when he accidentally knocked a metal spring off his desk. 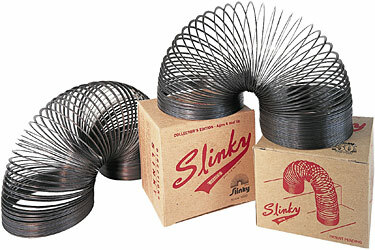 After over 60 years, Slinky is still traveling end-over-end across floors, down stairs and into children's hearts. Colorforms (1951) -- Two struggling art students experimented with vinyl shapes to inexpensively decorate their walls, and Colorforms were born. A time tested favorite among generations of kids past and kids of the future. Mr. Machine (1960) -- Take a trip back in time, Mr. Machine, the one-of-a-kind take-apart robot, is as loveable and fun as he was when introduced in 1960. Wind him up, press the lever, and watch him walk along. Comes numbered in a classic box with certificate of authenticity and collector's manual. Marvel the Mustang (1967) -- Introduced in 1967, this 2 foot tall horse is the all-time ride-on classic. Back To Basics Toys sells specialty classic toys that stimulate kids' minds, develop skills, promote dexterity, and foster the use of imagination and creativity. The company is a division of Scholastic.